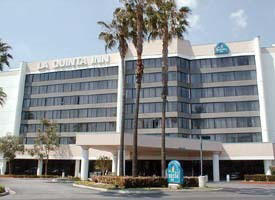 The Centerpointe Suites located within the La Quinta Inn in La Palma offers court reporting services for TO&A clients in beautiful surroundings and a convenient location. Our clients enjoy the use of an elegant reception area and three fully-furnished conference rooms with ample function space to accommodate depositions of almost any size. Advanced audiovisual technology is available, and our own professional staff will be on hand to handle all your court reporting needs. Centerpointe Suites is just 22 miles from Los Angeles International Airport, and just 20 miles from John Wayne/Orange County Airport. Nearby are the famous entertainment area like Disneyland, Knott’s Berry Farm, and Los Alamitos Racetrack.